A model walks during the Louis Vuitton Menswear Fall/Winter 2019-2020 show as part of Paris Fashion Week on January 17, 2019 in Paris, France. It is a tribute turned troubling reference for the team at Louis Vuitton menswear—and arguably one that was always bound to be problematic. When Virgil Abloh sent guests single white spangled gloves as invites to his Fall-Winter menswear presentation (his second for the French house), it was clear the spirit of the man widely known as King of Pop would also be in the building. And MJ was indeed present—on the “Billie Jean”-inspired set, in sometimes on-the-nose design references (see the T-shirt airbrushed with his iconic pose, above), and as one would expect, even in the show’s soundtrack, including a fairly stunning finale. The collection was widely lauded as a success. But mere days after Abloh’s Parisian tribute to the controversial star he reportedly called “the most important person in innovating menswear ever,” (h/t Elle), the explosive documentary Leaving Neverland premiered at Sundance, setting off a renewed round of sexual abuse allegations against the late entertainer. 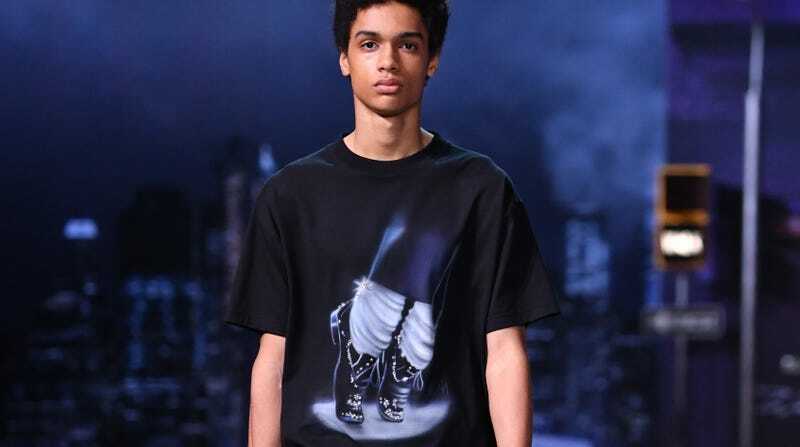 In response to the deeply troubling and triggering testimonials featured in the documentary, it now appears the Michael Jackson-themed designs that walked Abloh’s runway will never make it to consumers, as the designer and Louis Vuitton have pulled the items from production. Of course, Abloh’s statement only sparks the age-old question: Can—or should—art be separated from the artist? While many may argue that without that level of cognitive dissonance, there would be far less creative genius in the world, it is equally true that without the level of fame attached to those alleged to be predators, they would never have been granted that type of access to their accusers. The allegations against Jackson were not new; neither did that fact make them less damning, or less worthy of consideration and concern. Perhaps the largest cause for concern is that if they are true, most of us have been expertly living with that aforementioned cognitive dissonance for far too long.